This looks promising. Great devs behind it. And DeNA. And Unity. I hope this game gets serious traction along the road to higher mobile quality games. They’ve been touting their control scheme as a major feature and, although it’s not exactly brand new or 100% unique (we were experimenting with one-finger-rotate and touch-move FPS controls back in ’09 — players were not quite ready for it then), it’s the right approach at the right time with the right team. Draw Something has continued to do very well in the App Store and now we’re seeing more derivatives — apps and games with basic painting and sketching capabilities. Last weekend I had some fun playing around with a basic painting setup, just to see how much brush (pun intended) I’d have to go through to get to the painting picnic. On iOS, there are really only a couple of ways to implement a painting app — Quartz or OpenGL ES (there’s a nice little walk-through using Quartz here, and Apple put together a cool little OGL example called GLPaint here). It should be relatively clear that the OGL approach is cleaner, more flexible and a bit faster. But while GLPaint is a nice place to start, it’s not very app- or engine-friendly in the context of a full-fledged OGL app. Since the point of GLPaint’s example code is demonstrate how to do basic painting, it has no need to consider the rest of your OGL surface’s render loop, nor does it concern itself with other important engine pieces, like your OGL redundancy state checker, sorting and synchronization issues between render and update calls, and most important, clearing the buffer. That last bit really is most important because a nicely-performing painting app should never clear the buffer. Doing so will quickly slow things down to a slide-show. This should be obvious: In order to paint to the screen — whether you’re using GL_POINT_SPRITE_OES or rolling your own quads — you’ll need to draw a ton of sprites on-screen to get a continuous line of color and/or texture. If you clear every frame, you have to re-draw every frame, and voila, you’ll have molasses in less time than it takes to launch the simulator. If you don’t clear, you’re only drawing a handful of new sprites each frame. The GLPaint example does this — it doesn’t clear the buffer. However in a real-world app, you must clear every frame in order for anything else — GUI elements/textures, mesh rendering, camera changes, etc. — to work. Hence the conundrum — you need a nice, normal clear/render loop but you also need a render-only call each time you want to paint. Below is the entire class (note that several of the vars are structs elsewhere in the engine, but you get the gist). An NSMutableArray of multiple instances of this class is kept by the caller; each instance is born on finger-down (where we set color, brush texture and size) and dies on finger-up. Replay is easy — essentially just a programmatic rendering of the verts that were previously recorded while iterating over the NSMutableArray, handled with a flag in the Render() function. Below is the basic idea. One of the cool things about using OGL for painting and sketching is that you can very easily change up the brush texture, for nice Photoshop-like texture brushes (care should be paid to how you setup the blending, however, due to pre-multiplied alpha on iOS). While it’s possible to do this with Quartz, it’s much easier to grok using OGL. 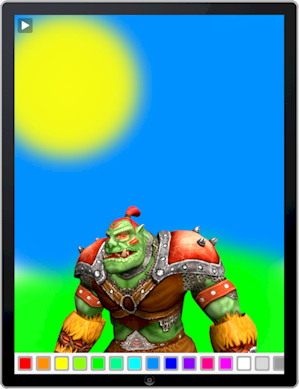 And of course you can do silly/fun stuff like paint a background behind your 3D orc model (maybe there’s a game idea in there somewhere, hmm — ok, maybe not). GamesBeat has a blurb on the high-retina-lution of the new iPad. There’s a quote in there from Wooga’s CEO about how incredible he thinks Diamond Dash looks on it. Yes, at double the pixel res (quadruple the pixels) of the old iPad, [full retina res] graphics look better — in my opinion maybe 5-10% better. Is that enough to justify slower performance and twice the wait to download the app? In most cases, probably not. Apps that are very text-heavy get a better boost, certainly, than graphics. And for show-stopper games that are essentially art demos, like Infinity Blade II, I could see justifying it. As a pure marketing strategy it could also make sense. When iPhone 4 hit, I asked my wife’s dad, who is a retired retina surgeon, about the new display. He thought it looked awesome, but also thought the retina claims were oversimplified, pushing the truth and part marketing/hype. Do most apps really need the extra resolution and sharpness? Raymond Soneira says probably not.